Remove the membrane from the back of the rib slabs. In a small bowl, combine the dry rub ingredients and mix well. Reserve a tablespoon of the rub for the liquid seasoning mixture. 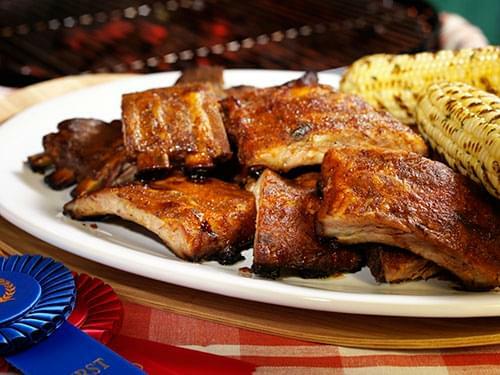 Generously apply the dry rub onto the front and back sides of ribs. Gently pat to ensure that the rub will adhere. Build a charcoal fire for indirect cooking by situating the coals on only one side of the grill, leaving the other side void. Add a small aluminum pan to the void side of the grill and fill it halfway with water. When the charcoal grill reaches 250˚F, place ribs meat-side up on grill grate and cook over indirect heat for two hours and 15 minutes. Remove the ribs from the grill. Place each slab meat-side down on its own doubled aluminum foil square. The foil should be large enough to completely wrap each slab. Mix the liquid seasoning in a small bowl. Pour ½-cup of the liquid over each slab. Then, tightly wrap and seal each slab with aluminum foil. Place the wrapped ribs back in cooker for one hour at 250˚F. Remove the ribs from the charcoal grill, unwrap and discard foil. Brush finishing glaze on both sides of the ribs. Place the ribs back on the grill for 15 minutes, or until sauce caramelizes.